there's metallic gold thread in the feather, but the photo doesn't capture it. 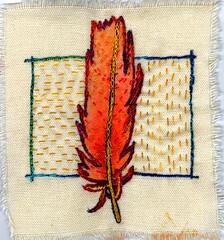 All of your parrot feathers are so great - whether stitched, fabric painted or watercoloured. I love the designs. I've never tried painting feathers - may have to give it a go now you've inspired me! I'm slow finding your blog but very happy I finally did. I share your love of sketching and fiber. This piece is especially gorgeous!